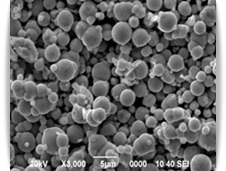 Magnetic micro- & nanopowders (Co-Fe-Si-B, Ni, Co, Ni-Co, Ni-Fe, magnetite, maghemite, etc.) with magnetic, magneto-rheological and catalytic properties, prepared by gas-liquid atomization, mechanical milling/alloying, arc discharge, chemical reduction, or co-precipitation method. The micro- and nanoparticles have been technical and clinically tested successfully for industrial and (bio)medical applications (i.e., magnetic nanoparticles functionalised with biomolecules for magnetic detection based on the GMI effect).